This book provides an overview on nanostructured thermoelectric materials and devices, covering fundamental concepts, synthesis techniques, device contacts and stability, and potential applications, especially in waste heat recovery and solar energy conversion. The contents focus on thermoelectric devices made from nanomaterials with high thermoelectric efficiency for use in large scale to generate megawatts electricity. 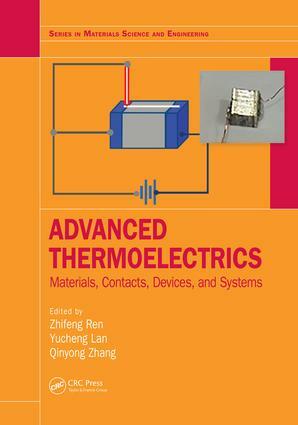 Covers the latest discoveries, methods, technologies in materials, contacts, modules, and systems for thermoelectricity. Addresses practical details of how to improve the efficiency and power output of a generator by optimizing contacts and electrical conductivity. Gives tips on how to realize a realistic and usable device or module with attention to large scale industry synthesis and product development. Prof. Zhifeng Ren is M. D. Anderson Professor in the Department of Physics and the Texas Center for Superconductivity at the University of Houston. Prof. Yucheng Lan is an associate professor in Morgan State University. Prof. Qinyong Zhang is a professor in the Center for Advanced Materials and Energy at Xihua University of China. Prof. Zhifeng Ren, an M. D. Anderson Professor in the Department of Physics and the Texas Center for superconductivity at the University of Houston, has been leading the field of nanostructured thermoelectric materials and devices and other scientific fields. His group published an article in Science in 2008 to establish that ball-milling/hot-pressing method is the way to produce thermoelectric nanocomposites significantly enhanced thermoelectric properties in bismuth-telluride system. The work has pioneered the field of nanostructured thermoelectric materials and has been cited over 1000 times. Following the pioneer work, his lab has successfully enhanced thermoelectric properties in various thermoelectric nanomaterials such as YbAgCu4, PbTe/PbSe, skutterudites, half- Heuslers, SiGe alloys, etc, covering 20 K to 1300 K. These thermoelectric nanomaterials were fabricated into thermoelectric devices to harvest waste heat and convert solar energy (published in the journal Nature Materials in 2011). His group has published more than 300 papers in peer-reviewed journals, including Nature, Science, Physical Review Letters, Journal of the American Chemical Society, Nano Letters, Advanced Materials, Small, Advanced Functional Materials, Advanced Energy Materials, Energy & Environmental Science, ACS Nano, Advances in Physics, Proceedings of the National Academy of Sciences, and so on, and these papers have been cited for over 20,000 times. Various new thermoelectric materials with good thermoelectric properties have been discovered and fabricated in the past a few years, including the most recently discovered MgAgSb-based materials. Prof. Yucheng Lan, an associate professor in Morgan State University and was a research assistant professor in the Department of Physics and the Texas Center for superconductivity at the University of Houston, has worked on microstructures of thermoelectric nanomaterials and devices. He is an author of 90 peer-reviewed papers published in Nature Nanotechnology, Science, Physical Review Letters, Advances in Physics, Nano Letters, Advanced Materials, Advanced Functional Materials, Advanced Energy Materials, Proceedings of the National Academy of Sciences, etc. His work has been cited over 3,000 times with an h-index of 24 (ISI Web of Knowledge). He is co-author of one book (320 pages, Springer, 2012). Prof. Qinyong Zhang, a professor in the Center for Advanced Materials and Energy at Xihua University of China and a researcher of the Key Laboratory of Fluid and Power Machinery of Ministry of Eductation of China, has worked on synthesis of thermoelectric nanomaterials and design of waste heat recovery systems, including the technology of large scale thermoelectric nanomaterials production and module manufacturing. He is an author of 20 peer-reviewed papers published in Nano Letters, Energy & Environmental Science, Nano Energy, Journal of Applied Physics, etc.